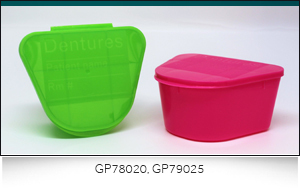 The GP750 denture cup series with translucent lid - 8oz container available in various colors has lid clearly marked with DENTURES/NAME/ROOM information area. The GP780 series is new single piece denture cup with living hinge and snap fit design in distinctive bright colors to assist in the prevention of loss or misplacement. Available in distinctive bright colors to assist in the prevention of loss or misplacement. The opaque grey GP77508 stool specimen container and Lid are utilized for secure and safe containment and transport of stool specimens. The 8oz containers come with leak-resistant, snap-on lids with space to mark with pertinent specimen/patient information. All cups and lids are latex and BPA free.